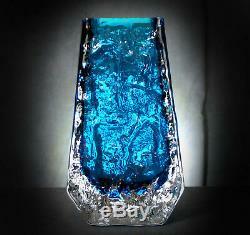 LOVELY GEOFFERY BAXTER DESIGNED WHITEFRIARS KINGFISHER BLUE. THIS IS A LOVELY WHITEFRIARS COFFIN VASE DESIGNED BY GEOFFERY BAXTER AT THE WHITEFRIARS FACTORY IN 1969 AND IS MODEL NUMBER 9686. IT IS DEPICTED AS A CASED BLOWN RELIEF MOULDED COFFIN SHAPE IN KINGFISHER BLUE SODA GLASS WITH QUITE AN INTERESTING TEXTURE TO TWO FACE SIDES. 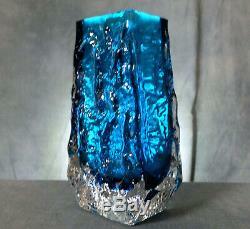 IT MEASURES 5 1/4" (13.5cm) H x 3" (7.75cm) W APPROX; AND IS IN EXCELLENT CONDITION WITH NO DEFECT AT ALL TO REPORT. THIS IS A LOVELY PIECE OF PERIOD SIXTIES DESIGN BY ONE OF THE BEST BRITISH DESIGNERS, THAT IS IN GREAT CONDITION AND WITH A LOW START PRICE SHOULD GET A LOT OF INTEREST FROM COLLECTORS. THERE IS NO RESERVE ON THIS SALE. ALMOST EVERYTHING I SELL IS IN THE CONDITION I HAVE BOUGHT IT, UNLESS OTHERWISE STATED, (I HAVE LEARNT TO MY COST IN THE PAST NOT TO TAMPER WITH AN ITEM), AND THEREFORE I HAVE NEITHER HAD ITEMS REPAIRED NOR RESTORED. I WILL ENDEAVOUR TO REPORT ON AN ITEM WHICH HAS HAD EITHER; HOWEVER I TAKE NO RESPONSIBILITY IF AN ITEM HAS BEEN TAMPERED WITH AND I CANNOT DETECT IT. SO PLEASE READ THEM CAREFULLY AS THEY ARE BINDING. DO NOT HESITATE TO CONTACT ME IF YOU NEED ADDITIONAL INFORMATION. 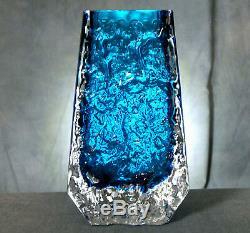 The item "LOVELY GEOFFERY BAXTER DESIGNED WHITEFRIARS KINGFISHER BLUE TEXTURED COFFIN VASE" is in sale since Friday, November 16, 2018. 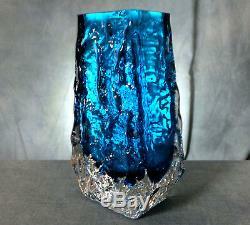 This item is in the category "Pottery, Porcelain & Glass\Glass\Art Glass\British\Whitefriars". The seller is "rtzilla" and is located in London. This item can be shipped to all countries in Europe, all countries in continental Asia, United States, Canada, Australia.